Well partial bedrest may not be conducive to totally decluttering the apartment or decorating the "nursery" (otherwise known as the cosleeper attached to my side of the bed, since baby will be rooming with us for at least a year), but it definitely helps with the knitting mojo. Most evenings of late have been spent lying on my left side feeling super-uncomfortably pregnant, watching Marvel: Agents of S.H.I.E.L.D. on Netflix with the husband and knitting some last-minute baby things. 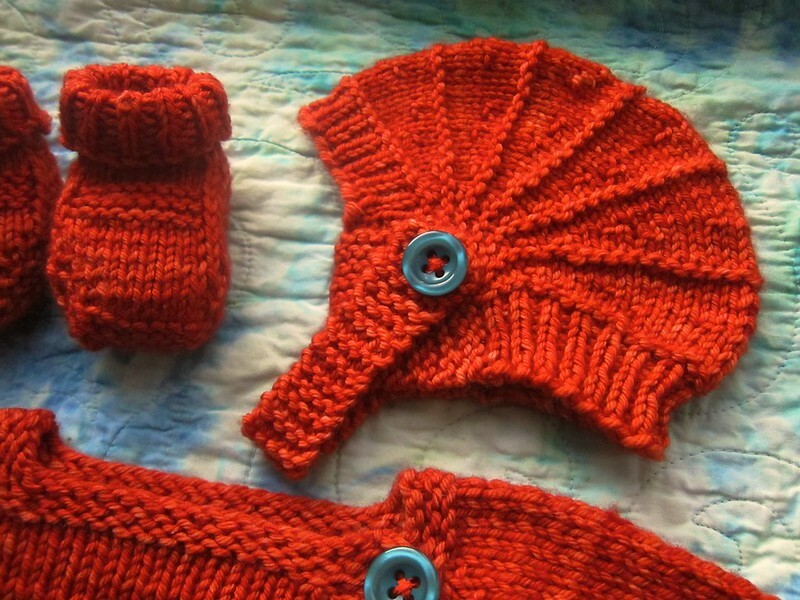 After finishing the orange wool Beyond Puerperium cardigan sweater I blogged about recently, I decided to make a matching hat and booties with the leftover yarn. The hat is the free Aviatrix pattern by Justine Turner — my version Raveled here with all construction details. It was super quick to knit, has a fun construction method, and should keep baby's ears nice and warm. 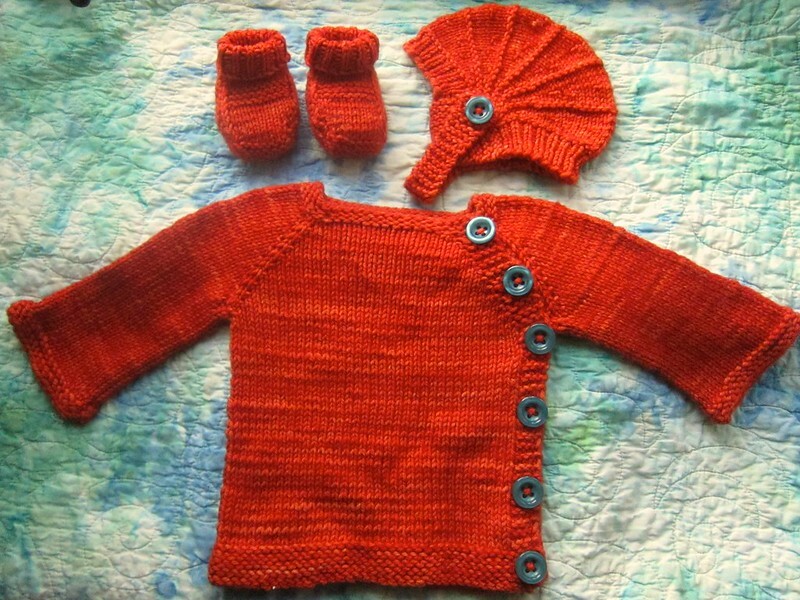 Again, the yarn is soft, squishy washable merino wool — Malabrigo Rios in Glazed Carrot. The booties are the free Gansey Booties pattern (my version Raveled here) and while they are cute and a quick knit, they inspired a lot of reknitting and swearing. 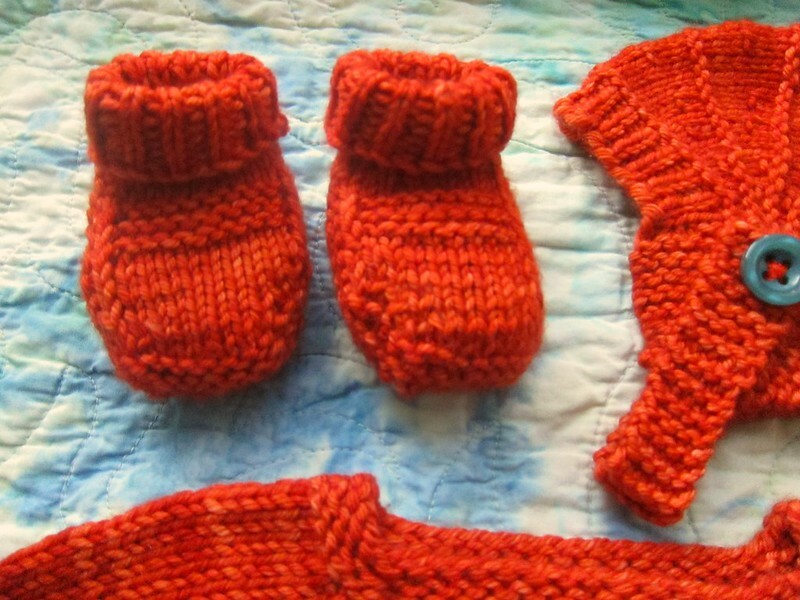 The directions for the short-rows were not very clear, and I ended up knitting each bootie differently to compensate, so they don't really match. 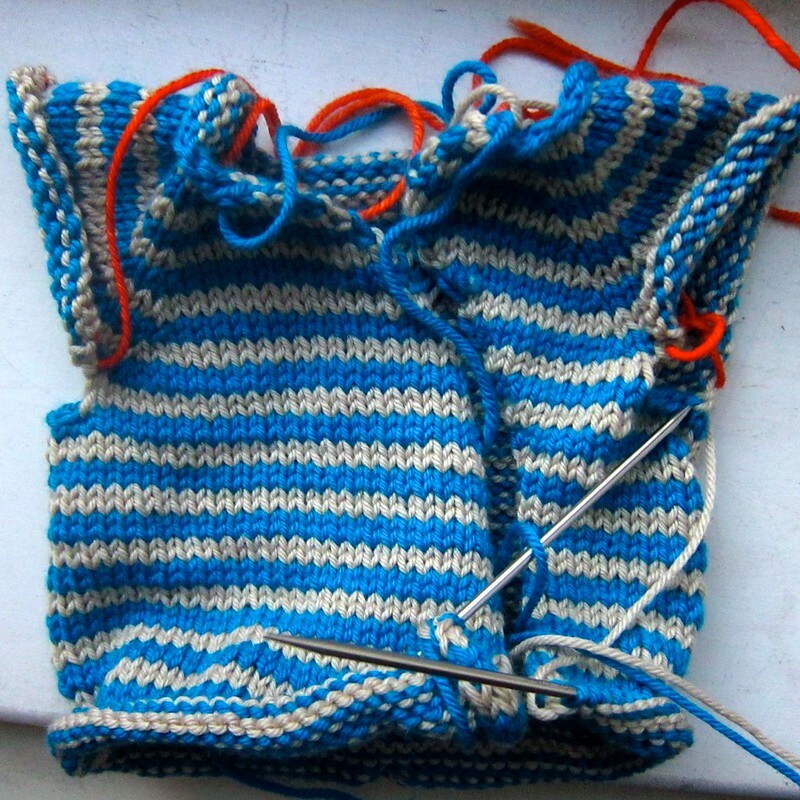 The instructions are to turn at the end of each short row--but not to wrap--and I wasn't sure if I was then supposed to start knitting again with the last stitch knitted, or with the one after the turn, or... am I just reading this wrong? If I attempt them again, I'll also make the cuff a lot longer to give them a better chance of staying on. The yarn is Debbie Bliss Cashmerino Aran, a super-soft and washable merino/acrylic blend with a bit of cashmere thrown in for good measure (or good marketing, anyway). And the panic (and excitement) is really setting in here. I feel really ready, but also not ready at all. And Baby Wood has now suddenly flipped from a nice head-down position to a terrible and uncomfortable sideways/transverse position and refuses to budge, despite all the crawling around on the rug and weird off-the-couch headstands I've been doing as per the Spinning Babies website for "optimal fetal positioning." There's still a few weeks for baby to turn back (and there's always external version) but it's freaking me out a little. Turn baby, turn! You'll be in my thoughts. My son was breech until 36 weeks, my daughter turned from vertex to breech to transverse and back to vertex between 38-40 weeks. Spinning Babies is a great resource. I would also go float in the pool and that seemed to help. Oh, and I had my pelvis adjusted with my son, it can't hurt. Best of luck to you. Thank you! The pool definitely feels good, and I hope it is helping to turn the baby as well. Just got a horrible week-long cold that has kept me from swimming but I find out tomorrow what position baby is in now. Fingers crossed!!! I have made more sweaters that my family loved and wore to bits out of the Bliss Cashmerino. I enjoyed touching it while I knit it. Tactile therapy for icky icky bedrest. Sorry for the bedrest situation. Glad it's not for too much longer. I agree that watching S.H.I.E.L.D. is an excellent way to numb the boredom. It's been a good season on that show! And your knitting is so beautiful.